Nestled alongside the Browns River is Vancouver Islands best kept secret. 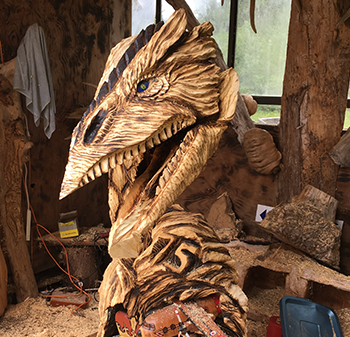 The West Coast Chainsaw Artist found a little piece of paradise and decided to set up his Outdoor Gallery at the Forbidden Studios, located at 4010 Forbidden Plateau Rd., Courtenay, BC. Take a walk around the gardens and forested pathways, where you will see Kevin Lewis’ spectacular chainsaw carvings. These aren’t just your typical roughed out chainsaw carvings, these are a work of fine wood art. As you enjoy your stroll through the grounds you will see wildlife, fantasy and a variety of functional art sculptures. 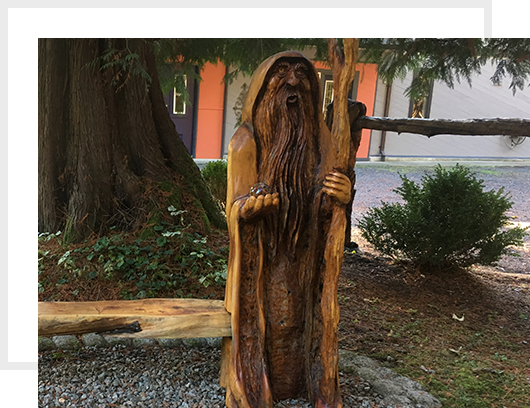 When he is not at his gallery, this fine artist can be seen carving at exhibitions, fairs and other events across Canada, displaying the transformation of a plain block of wood to an amazing piece of artwork. 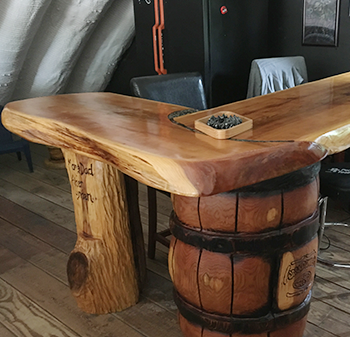 All his pieces are one of a kind works of art, and commissioned, custom orders are available. 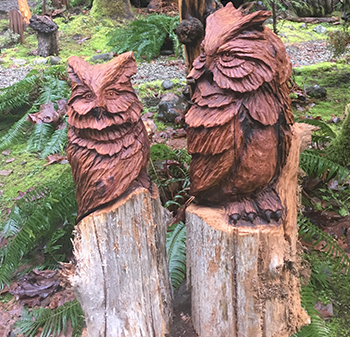 Each fine art piece is carved from reclaimed BC wood, consisting of Red and, Yellow Cedar, Maple and rare birds’ eye burls. Intricate root systems and driftwood make up his more talked about pieces. He has been interviewed and noted for his talents in the Comox Valley Record, CTV Vancouver Island News, Global News, as well as several publications throughout Alberta. As he is sponsored by Husqvarna Chainsaw. Functional fantasy and wildlife carvings are incorporated into one of a kind benches, tables, headboards and mirrors. Wildlife art is expressed through realism with natural features. Fantasy creatures designed with imagination includes dragons, faeries, wizards and mermaids.